Gujarat Vishwakosh Trust, Usmanpura, Ahmedabad. ‘Paraspar’ is a monthly talk series, in which practitioners from fields of literature, journalism, films, television, theatre, arts, photography, web etc share their experiences and influences. 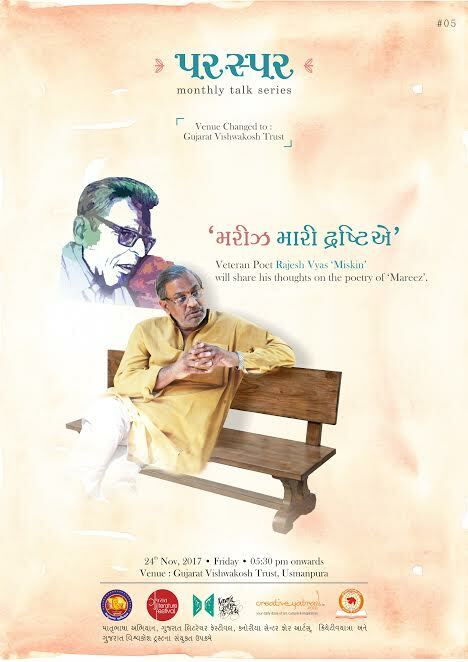 In the fifth talk of the season veteran poet Rajesh Vyas ‘Miskin’ will share his thoughts on the poetry of ‘Mareez’. Entry to event is free and is open to culture enthusiasts of all age groups.